Let’s talk about skirts for a minute. If, like me, you wore a uniform for 12 years of your life, and that uniform included a not-cute-post-second-grade plaid, pleated skirt, then you might not care to ever wear a skirt again for the rest of your life. If, like me, the one and only time you got detention was because your mom hemmed your skirt half an inch too short, then it wouldn’t be an exaggeration to say that you’ve been a bit scarred by skirts. And now, in adulthood, you may see other women wearing skirts and think they look fabulous, but you happily reach for the jeans that you were denied for so many years. If you’re like me, then you’ll understand that when my husband put in a request for me to wear more skirts, I wasn’t exactly eager to oblige. But they say marriage is compromise. I found a pretty, floral-print style and after a few wears, I was already singing a different tune about skirts. It turns out that non-uniform-grade varieties are super comfortable, flattering, and don’t need to be rolled three times at the waist before you’d consider wearing them in public. I’ve since been seeking out skirts and picked up this striped number from Gap. It’s perfect for pairing with a tucked-in tank or a slouchy, summer-ready tee (I’m loving this on-sale steal from Madewell that says “beach”!). Do you have any go-to styles for skirts that you recommend? No plaid or pleats just yet, thank you. Madewell tee. Gap skirt. J. Crew hat. Splendid sandals. David Yurman bracelets. Michele watch. That skirt is beyond perfect! Loving how you put this look together! And I definitely like pairing skirts with just casual tees! I agree with Beth, amazing gams! 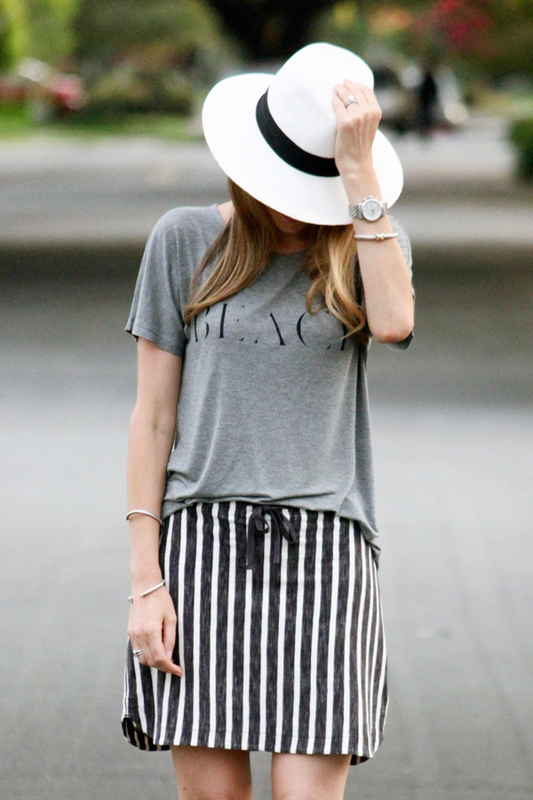 I also and partial to the tee and hat, love! Thanks, Marlen! I'm glad that you could relate as a fellow former uniform-wearer! Hmm, maybe I will have to try a midi skirt next. They look so tricky to pull off sometimes, but you always do it wonderfully! xo!